Not to be confused with Frozen Wario. Snowman Wario is one of Wario's many transformations in the Wario Land series of games. It is triggered by having a snowdrift fall on Wario's head. 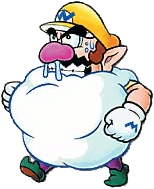 He is then covered in snow, reducing his walking speed (as well as disabling his ability to jump in Wario Land 4), but allowing him to defeat baddies when he touches them. Also, if he steps on a slope, he will turn into an uncontrollable rolling snowball able to break Snowman Blocks. When he hits a wall, he will become normal Wario. This transformation is functionally similar to Ball o' String Wario. ↑ Wario Land 3: Fushigi na Orgel Japanese instruction booklet, page 24. ↑ Wario Land Advance: Yōki no Otakara Japanese instruction booklet, page 29. This page was last edited on April 23, 2019, at 08:32.